is my anchor swivel installed correctly? The guy on the boat next door thinks the swivel shouldn't be connected directly to the anchor. Thinks a shackle should be in between. The swivel does occasionally bind to the anchor--kind of like a pocket knife a quarter of the way open. I agree if you use the swivel. But I'd throw it away. Throw the swivel away? The marina store had a similar shackle to the existing one. I already decided to remove the swivel(temporarily) and just use the 2 shackles. I agree with your neighbour. Why do you have a swivel? Does it make a difference? Is it fixing a twisted chain issue? Did it come with the boat or did you fit it? I have my doubts about those shiny ss "anchor connectors". That it binds, and the jaws don`t look entirely straight, should be concerns. If you want/need one, a good old fashioned "figure of 8" galvanized one might be better. Never had a need for a swivel and would never use one. A "proper" anchor shouldn't need one either. What kind of anchor are you using? My anchor at times is difficult to get to go into the anchor roller right side up. I don't have a swivel but would love a solution. Interesting. Not being terribly bright, I am not sure I understand how that works? Do you have a rope rode, with some chain? If so, then a swivel is a good idea. Otherwise you or your crew will end up with a very sore lower back. My anchor was hard to swivel correctly on retrieval sometimes. So I added a galvanized, oversized swivel with an extra shackle so it cant be stressed sideways. All the naysayers on swivels can have tbeir say, but like any system on a boat...a thorough understanding how it works, its strengths and liabilities and maintain it properly....and it is no more a weak link than most captains are. I prefer simplicity so don't use a swivel and I didn't like the potential of side loads breaking the pin. There is a price to pay, it can take several tries to get anchor aligned right in the bow roller when using all chain rode. I've since switched to nylon and anchor retrieval seems easier. Do you have any chain on there? 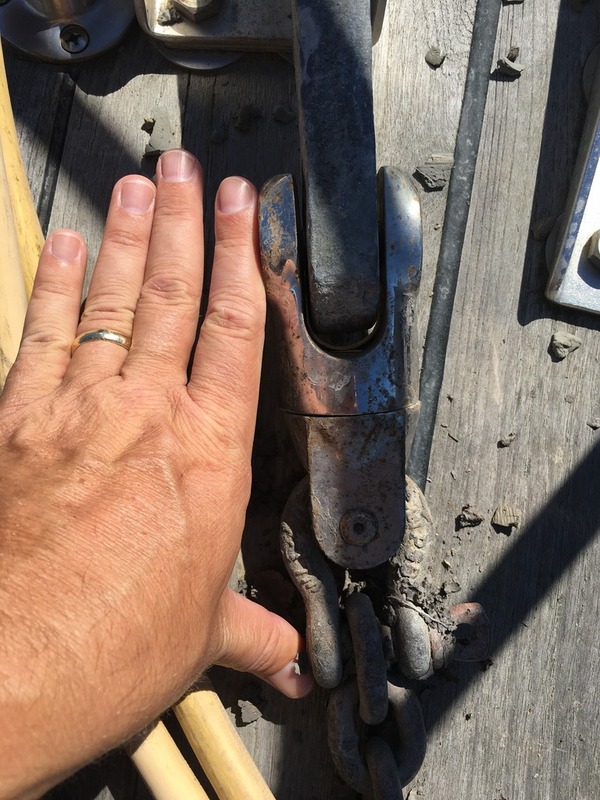 I need a swivel to right the anchor at the roller. The ultra anchor people make a unit that does that. It is also a ball and socket type which alleviates many of the side stress issues that some swivels have. I see pros and cons of the swivel and the deciding factor for my set up is is the flip factor. I think having a self-launching anchor roller is helpful in this regard. Might be scare mongering, but I've seen enough photo's of snapped & cracked stainless steel rode hardware...the problem being, you have no idea it's about to fail because there are no outward signs of impending doom. Much prefer the unsightly, haggard, bent galvanized versions that you replace out of embarrassment long before they fail in use. The swivel came with the boat. 80' of chain, then rode. Removed the swivel and just have a single shackle between the anchor and chain. Plenty of movement for side load. I think all is well. EDIT--Even with the swivel, I had issues aligning the anchor onto the rollers, so I probably won't miss it much. So when you have the rope in and you get to the chain, how do you make sure that the chain is aligned in the gypsy so that the anchor comes in right? Other than letting it back out and twisting it manually? I have an old school looking galvy swivel in my set up too, I have no problem with it. I am all chain and wouldn't be but for the fact it would be a whole lot of work to switch back to rope as the boat was originally set up for. 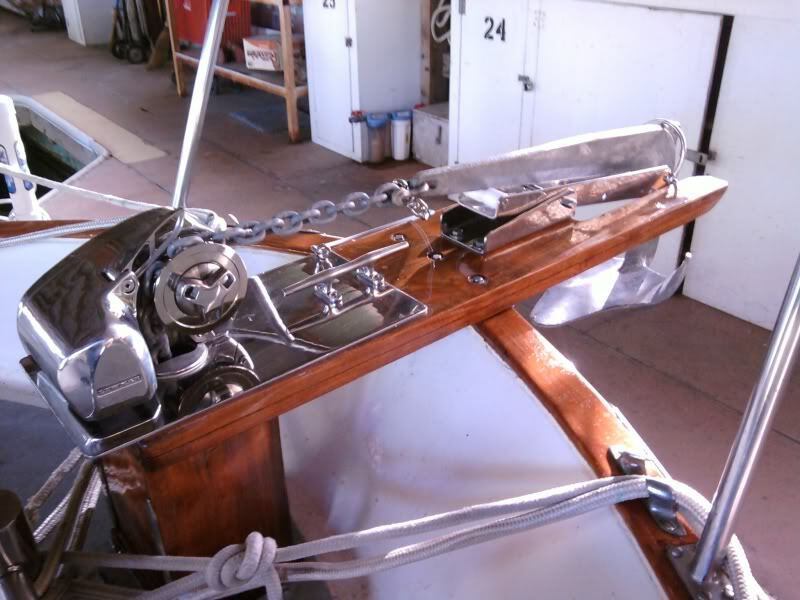 Apparently a different winch was put on at some point to run all chain, and the fittings and tubes thru the deck wont allow any thing bigger than the chain to run thru them, no shackles or thimbles, nada.